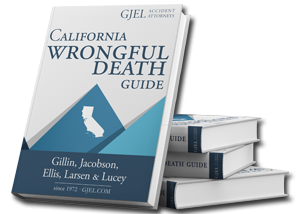 GJEL Accident Attorneys is a California wrongful death law firm that has helped our clients recover over $1 Billion Dollars after the unexpected loss of a loved one. The unexpected death of a loved one is a devastating event that no one prepares for. The emotional toll of such a tragedy can be much harder to bear when another person or entity is to blame for your loss. In California, when someone’s death is the result of wrongful behavior or negligence, surviving family members can file what is known as a “wrongful death” lawsuit in civil court. An experienced California wrongful death lawyer can explain your rights and help you and your family seek justice for the pain you are experiencing. In this post, we provide a basic overview of wrongful death laws in California. We’ll cover the elements of a wrongful death claim, who can file a wrongful death lawsuit, and the different types of damages that are available to a successful plaintiff. We also discuss how the statute of limitations can impact your claim. This post is designed to give you basic information and should not be relied upon in the absence of advice from a qualified attorney. If you have questions about your rights or your family’s rights, contact a wrongful death lawyer right away. What is a “Wrongful Death” Case? The term “wrongful death” has legal significance in California. A wrongful death lawsuit is a type of civil legal action that can be brought by the survivors of a deceased person who died as a result of a wrongful act or negligence. Some wrongful death cases are filed based on behavior that is also the subject of criminal charges. In such a scenario, the two cases will proceed independently of one another. However, there does not need to be a crime or criminal conviction in order to bring a wrongful death case. Certain types of reckless or negligent conduct can be a sufficient basis for such a lawsuit irrespective of any alleged or proven criminal liability. Some wrongful death cases are filed based on behavior that is also the subject of criminal charges. In such a scenario, the two cases will proceed independently of one another. However, there does not need to be a crime or criminal conviction in order to bring a wrongful death case. Certain types of reckless or negligent conduct can be a sufficient basis for such a lawsuit irrespective of any alleged or proven criminal liability. Unlike a criminal lawsuit involving homicide charges like manslaughter or murder, which can result in a defendant being convicted and receiving a criminal sentence, fault in a wrongful death lawsuit leads solely to the award of money damages. If you succeed in a wrongful death lawsuit, the court will order the responsible party to pay a sum of money to you and your family members. As discussed in greater detail below, this sum of money can include damages for medical bills, funeral costs, lost income, and loss of emotional support. What Does a Wrongful Death Lawyer Do? We hire expert consultants in order to evaluate the evidence for the particular accident to help us determine exactly what happened at the time, depositions of witnesses and involved parties are taken, all of which combine to allow us to develop a solid case that fault for the accident was on those responsible parties that we are bringing suit against. The damages in a wrongful death case, however, are proven differently to a great extent than a personal injury case. Sometimes there’s a medical issue as to whether or not the accident in question led directly to the death of a loved one, but most of the time it’s pretty clear unfortunately from the accident what happened. Where necessary, however, we will retain the necessary consultants to prove that it was this accident, not some preexisting condition that led to this person’s tragic death. Much of what we do, however, in terms of proving damages in a wrongful death case revolves around the duty to show everyone exactly who this person was, who has passed away so suddenly and tragically – and we do that by talking to anyone and everyone we can find who knew them. Mostly family members, friends and coworkers – the people close to this person who help us show exactly what they meant to their family and friends. We do statements, we do video, we use photographs – all kinds of things to put together a portrait that ultimately is normally turned into a video about this person, who they were and most importantly what they meant to the family member or family members we represent. Filing the lawsuit — A wrongful death lawsuit has many requirements and must be persuasive enough to successfully present your case and stand up to challenges by the other party. Gathering evidence — Evidence in your favor is gathered in many different ways, including through investigators, depositions, document requests, and more. Challenging the other side’s defenses — The other party will certainly raise legal defenses to avoid liability. You attorney will answer back to challenge those defenses and protect your rights to a recovery. Negotiate a favorable settlement — The majority of wrongful death lawsuits are settled out of court but this does not mean you should accept a settlement that is too low just to avoid trial. Your attorney will effectively use new arguments and evidence to negotiate until you receive the settlement offer you deserve. Represent you at a jury trial — If the liable party refuses to make an adequate settlement offer, your attorney will present your case at a trial, which involves strict rules of evidence and procedural requirements. What are the Elements of a Wrongful Death Case? In legal terminology, an “element” is an essential building block of a case. In order for someone to succeed in a case, the evidence must establish all of the required elements. In a wrongful death lawsuit in California, the following elements must be proven. The surviving family members are suffering financial losses as a result of the death. We’ll now discuss each of these elements. Element One: What Kinds of Accidents or Intentional Acts Cause a Wrongful Death? There are several different kinds of accidents that can lead to a wrongful death. These include car accidents, commercial truck accidents, bicycle accidents, pedestrian accidents, the use or consumption of dangerous or defective products, prolonged exposure to toxic chemicals, medical malpractice by a doctor or healthcare facility, fires, and other types of fatal accidents. Intentional acts such as a deadly assault, manslaughter, murder, arson, or other deliberately harmful act also may be the basis of a wrongful death claim. Element Two: Was the Death Caused by Negligent or Intentional Conduct? The causation element is critical in a wrongful death claim. In order to recover damages, you must be able to show that your loved one’s death was actually caused by the negligent or intentional conduct of the defendant. For example, you cannot sue a hospital just because your loved one died of cancer there. There is no wrongful death liability when someone dies purely from natural causes. However, if you can show that your loved one died of cancer as a result of prolonged exposure to cancer-causing chemicals in his or her workplace, you may be able to sue the former employer for wrongful death. Because causation in a wrongful death lawsuit can be difficult to establish, it is important to hire a lawyer who has extensive experience taking wrongful death lawsuits to trial and obtaining successful verdicts for his or her clients. Element Three: Have Survivors Suffered a Loss? You and your family must be able to establish that you have suffered losses as a result of your loved one’s death. These might include loss of your loved one’s affection and emotional support, financial support, or contributions to the household. Other types of losses include money you spent or will need to spend to take care of your deceased loved one’s medical expenses and funeral costs. A wrongful death lawyer can help you understand the full value of your wrongful death claim and will carefully calculate the amount of damages to which you are entitled. The deceased person’s surviving children and grandchildren. In the event that there is no surviving person who falls into any of these categories (sometimes referred to as the “line of descent”), a wrongful death lawsuit may be filed by someone who would be entitled under California law to inherit the deceased person’s property. This may include the deceased person’s parents or siblings, depending on who is alive at the time of the deceased person’s passing. A qualified wrongful death lawyer can help you understand who can file a wrongful death lawsuit and how any proceeds from the lawsuit will be distributed amongst surviving family members. A bicyclist was struck by a vehicle as he crossed an intersection on Fairgrounds Drive in Vallejo. After fighting for his life for months in the hospital he eventually succumbed and passed away, leaving behind a wife and three young daughters. His post-accident treatment at the hospital produced a staggering bill. Jim Larsen and the lawyers of GJEL investigated the accident thoroughly, deposing police officers and witnesses from the scene of the accident. Through witness and expert testimony we were able to demonstrate that even though the bicyclist was crossing against a red light, the driver still had ample time to see the cyclist and slow down to avoid the collision. Unfortunately for all parties involved, this was not the case. GJEL was able to secure a $500,000 settlement, with $100,000 going to each of the three daughters as a college fund. We have helped thousands of injured victims in the Northern California area get the compensation they deserve. How Long Does a California Wrongful Death Case Take? An effective wrongful death lawsuit can take some time. It’s essential that enough time is allotted to conduct a thorough investigation to understand all of the facts of the case including the responsible parties. In some cases, the liability can be clear-cut. For example, if a FedEx truck driver was intoxicated and hit another car causing a death, it might be easier to assign liability to the responsible party. Other cases require more evidence though. One example of this would be a fatal slip and fall accident due to unsafe conditions at a grocery store. In this case, we may need to interview more witnesses, get security footage, and research records on past incidents. But even then, the insurance company that’s responsible to pay for the damages may not offer a reasonable settlement for the damages. Cases that require in-depth investigations and accident reconstruction work will take longer. In these cases, we may also need to bring in an expert witness to testify about the dangers that caused the accident. These cases typically go to a jury trial and the entire process can last from 1-2 years on average. If insurance companies don’t offer the full amount of the policy they can open the limit of the policy up and a jury can decide how much compensation you should receive. In our experience, most wrongful death cases go to trial because insurance companies offer unfair settlements or try to get you to settle quickly. Below are just a few of the recent settlements from wrongful death cases from GJEL clients. Click here to view all wrongful death settlements and verdicts. Below are answers to common questions we get asked frequently pertaining to wrongful death cases. Learn what a wrongful death lawsuit is and how you can file one. How much money can I get from a wrongful death lawsuit? There are a lot of moving parts with a lawsuit. In this article we explore the potential damages you can seek and how much money you may get. Here you will find a series articles that will teach you what to in the event of a California wrongful death. The pain and suffering that come with losing a love one shouldn’t be accompanied by financial distress. If your family has suffered a loss like this, please contact us now. When my son was killed in a car accident I felt lost. Life became very difficult and the insurance companies were being unreasonable. I’m thankful I called GJEL to help. They were able to help take away some of my stress and hold the right people accountable. I don’t wish my experience on anyone, but if you need an attorney the team at GJEL is the best you can ask for. What is the Average Settlement for a Wrongful Death Lawsuit? How is Compensation Divided Among Family Members in a Wrongful Death Claim? When you are grieving the accidental death of a family member, you may not immediately appreciate the full extent of how that person’s passing may affect your life…. Do you need money to hire a personal injury lawyer? What is a Statute of Limitations in California? A “statute of limitations” is a procedural court rule that requires lawsuits to be brought within a certain time period…. $10.8 million for a wrongful death against a tire manufacturer and auto supply chain.